Telling the truth about Dobby making his own rules and he banned me. He banned some1 for flying to low. He said that he alredy told that low flying is banable and i told him that he started making hes own rules not mick88 rules. Then he gave me a ban for 1 day and the reason was and i quote "Chill the hell out and come back". Knew you'd appeal. The ban was to calm you down. "He said that he alredy told that low flying is banable " :- i said id ban for it because im sick of seeing planes scattered all over the place, as well as people ditching them mid air. Why revoke when they can go back to the shop and get a license again? [18:02:20] Mayday delivered supplies from San Fierro Dock to Dutchmen keys Gas Station. [18:02:32] Petre delivered dirt from Glen Park Construction to Landfill. [18:02:32] <Salamy> how can he drop planes ? [18:02:43] <Salamy> isnt called divebomb ? [18:02:49] <The_Boss> admin the engine failed..
[18:02:49] San Andreas Police Department is now hiring! Log on to www.ConvoyTrucking.net to pass the test and receive your police badge today! [18:03:25] <The_Boss> we cant have fun anymore on this server..
[18:03:25] <ZainKing> who God :D? [18:03:38] <Dobby.> its breaking rules..
[18:03:40] Petre found a present in Bone County. 16 presents remain. [18:04:05] I.Andrei delivered concrete from Blueberry Constructions to Construction site. [18:04:30] Want to stay in touch with your convoy mates? Add them to /contacts. [18:04:37] ZainKing delivered equipment from San Fierro Transport to Airport. [18:04:46] TRGeorge delivered industrial waste from Solarin Industries to Landfill. [18:05:00] [RO]Silviu delivered concrete from Finalbuild Construction to Construction site. [18:05:10] Mario delivered supplies from Las Venturas Airport to Los Santos Market. 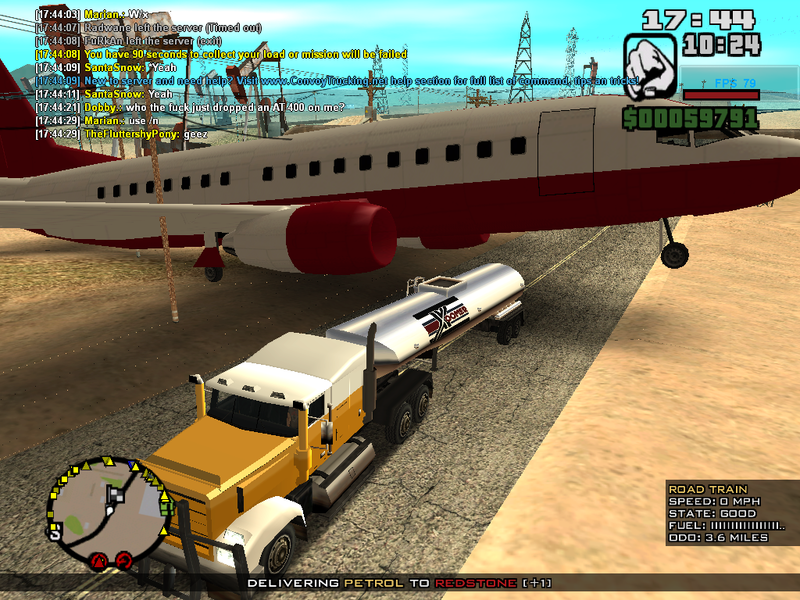 [18:05:21] UgurPks delivered mixed goods from Las Venturas Airport to Angel Pine Warehouse. [18:05:37] FuRkAn delivered mixed goods from Las Venturas Airport to Angel Pine Warehouse. [18:05:54] <The_Boss> ban everyone flying low from now on k? [18:06:35] Crispy delivered export goods from Blueberry Industries to Bayside dock. [18:07:03] Santa lost a present in Red County! Help him find 17 presents! [18:07:20] ZainKing delivered supplies from Airport to Well Stacked Pizza. On a lighter note, i had a plane dropped on me. It wasn't that funny.